Shoes all over the place can drive anyone nuts! Check out our many options for getting shoe clutter under control! We offer shoe storage benches, shoe cabinets, entryway benches with shoe storage, and a great wooden shoe rack. Shoe Lockers are also a fantastic way to get shoes off the floor! 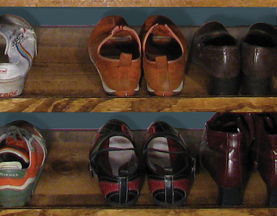 Have your own idea for a piece of shoe storage furniture? Let us build it for you! We can custom make furniture to fit your space and needs. Choose from over 40 color choices and two finishes to match your decor!